Inflation Coming? Treasury Market Says Otherwise! 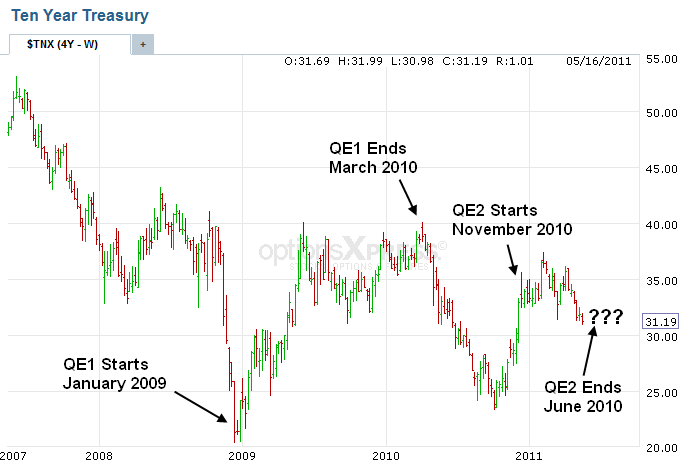 Because a picture is worth a thousand opinions take a look at the chart below which depicts the trajectory of ten year Treasury yields [during] the timeline of quantitative easing. [To repeat:] The multi-billion dollar Treasury market is stating that inflation does not exist… after responding to the initial perception that inflation was [just] a matter of time – and we’re talking private capital and independent thinkers, not the so-called “manipulation” by government statisticians. As QE1 got under way, the bond market sold off, pricing an expectation of higher inflation ahead. About midway through the process, the lack of inflation, among other factors, became apparent to market participants, and ten year yields stayed roughly between 3.5% and 4.0% until QE1 ended in March of 2010. Investors looked around and couldn’t pinpoint what the quantitative easing program had actually done [resulting in] yields dropping… from 4.0% to 2.5%. [When] the Federal Reserve announced another round of easy money… the rates popped [up] to around 3.75% and then took a deep breath. Once again, the market could not smell the familiar inflationary stink and yields dropped to today’s 3.15%. The quantitative easing sequel is about to end its run and, as the broad market sees it, [there has been] no damage and no solution either…In addition, the flow of recent economic data highlights a return to dismal growth, with a few encouraging signs along the way. [As such,] an understanding of why QE has not delivered the goods and why deflationary pressures persist is required. As I have stated before, the reason behind the money printing exercise’s failure to accomplish its goals is quite simple – the consumer is not responding. From an equity market perspective the generally accepted belief that financials outperform when rates are low is not materializing, and that goes to the unusual nature of the investment environment and the lack of reference points. Banks — not brokers or investment houses — are the “canary in the coal mine.” [As such,] my stance has been, and continues to be, bearish on the U.S. economy and bullish on the equity markets – strictly based on capital flows. Why would anyone use the bond market for analyzing inflation. The demand for bonds is heavily distorted.